Ask any English-loving football fan who is old enough where they were when England won the World Cup in 1966, or played unforgettable semi-finals during Italia ’90 or Euro ’96, and they could probably give you an instant answer and start recalling the emotions they felt at the time. Yet there has been one other occasion when England have reached the last four of a major tournament, but it barely ever gets mentioned other than when referencing England’s first ever sending off. Two years after winning the World Cup, England made it to the semi-finals of the 1968 European Championship. It was only the third time the competition had been staged, having been renamed from the European Nations Cup. We’ll pick up the story in the quarter-finals (technically this was part of qualifying, but it seems wrong somehow to class it as such here when sides at Euro 2016 will have to win through two rounds just to reach this stage). England had been beaten at home by Scotland in qualifying but had gone on to top the group to face holders Spain over two legs in the last eight. Sir Alf Ramsey’s England were World Cup holders and Home International champions. Now they could complete the treble by adding the European crown if they won through the next three rounds. With Manchester United soon to lift the European Cup, there was a sense that English football was enjoying a real period of success and England could cement that reputation by winning Euro ’68. But not everyone was in awe of England. Although they had lost just once since October 1965, their style of play was not universally loved and critics felt the World Cup triumph had only been achieved thanks to home advantage and crucial refereeing decisions going in their favour. If England could become champions of Europe, it could help silence many doubters. 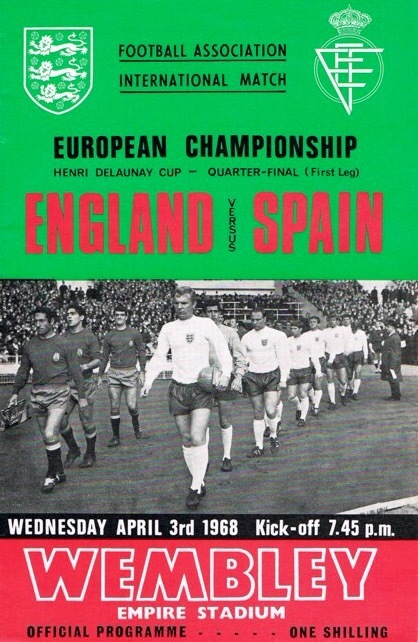 England welcome Spain to Wembley for the first leg of their European Championship quarter-final. The boys of ’66 still dominated England’s team two years on, although some new blood had broken into the side. Cyril Knowles, Alan Mullery and Mike Summerbee were in the team at home to Spain, with George Cohen, Nobby Stiles and Geoff Hurst the three players missing from the 1966 triumph. Cohen had been Ramsey’s first casualty of the 1966 XI, while Stiles was left watching on as Mullery assumed his midfield role. England had beaten the Spaniards twice in friendlies in recent years but this time around it looked like they may fail to make the breakthrough as chances went begging. With six minutes left, Bobby Charlton – hoping to end the season as a European champion for club and country – gave England a much-needed lead. 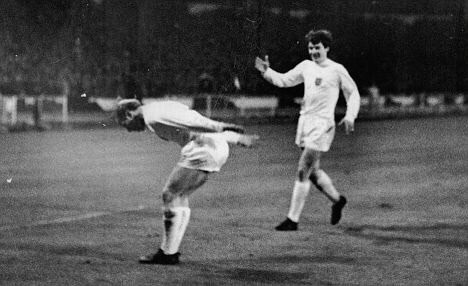 The goal meant Charlton equalled Jimmy Greaves’ record tally of 44 England goals and gave them hope of progression as they won 1-0 on the night. Bobby Charlton takes a bow after giving England the lead against Spain. But in an era when home advantage was still seen as very significant, there was a concern they could be eliminated in the return in Madrid five weeks later. Hurst again missed the game due to injury, while goalkeeper Gordon Banks could have been a significant absentee as Peter Bonetti deputised (with greater success than at the same stage of the World Cup two years later against West Germany). Brian Labone, Norman Hunter and Keith Newton all came into the side, for a match in front of a frenzied 120,000 crowd. The finals of Euro ’68 would mark the midpoint of the cycle between England winning the World Cup in 1966 and their bid to retain it in 1970. The performances they would give in Italy for the final two matches would offer some indication of how good they really were. After winning in Spain, a buoyant Sir Alf said of England’s great run of form: “This must end some time. But where, and who is good enough to do it?” It was the kiss of death as he wouldn’t have long to wait for an answer. Although England beat Sweden 3-1 in a Wembley friendly, they then lost 1-0 away to West Germany shortly before the finals began. It was the first time the Germans had defeated England and marked a turning point in fortunes between the sides, while also representing England’s first away defeat for four years (a record that that tended to be overlooked by those knocking their 1966 success as being purely down to home advantage). Of more pressing concern was the European Championship semi-final, as England arrived in Italy for a clash with Yugoslavia. Although the Yugoslavs had been absent from the 1966 World Cup, they had finished above West Germany in qualifying for Euro ’68 and then beaten France 6-2 on aggregate in the quarter-finals. This was certainly not going to be an easy test for England, in front of less than 22,000 fans in Florence. It was hardly a match for the purists, an ill-tempered game remaining goalless until the closing five minutes. Then a high cross evaded Bobby Moore and Dragan Džajić struck past Gordon Banks. Tensions had been building all night and a hard tackle on Mullery led to the player retaliating. He kicked his opponent Dobrivoje Trivic just yards from the referee and Mullery took his unwanted place in the history books as he was ordered off. England would almost certainly have lost anyway but the sending off effectively confirmed their exit, as they were beaten 1-0. Alan Mullery becomes the first man to be sent off against Yugoslavia in 1968. Mullery would also later say the FA fined him £50 – a decent sum of money at the time – for his sending off but Ramsey insisted on paying it on his behalf. Ramsey had stuck with Stiles amid condemnation for his challenge on France’s Jacques Simon at the 1966 World Cup and now he was standing up for Mullery. He was certainly a man who would defend his players. 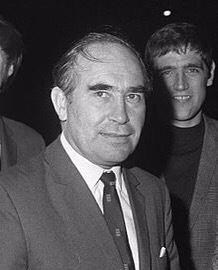 Sir Alf Ramsey spoke out about Yugoslavia after England lost to them in the semi-finals. For Mullery, the night in Florence would forever be associated with his name. “I can never get rid of it. I played more than 700 games in my career between the age of 15 and 34,” he said in 2012. “People always remember that game – or another one when I scored a volley against Leicester in the cup and it was on Match of the Day every Saturday night for a year. People just remember those two games, they don’t remember the other 698.” His sending off did not open the floodgates for other England players to be dismissed, as just three more would be sent off before David Beckham was red carded 30 years later in the 1998 World Cup against Argentina. For England there remained the third place play-off against the Soviet Union in Rome, to be played before the final between Italy and Yugoslavia. The Russians had only been denied a place in the final on the toss of a coin after drawing with Italy and had posed England problems the previous December during a 2-2 friendly draw at Wembley. Stiles took advantage of Mullery’s suspension to return to the side after more than a year out and he put in a sound display as England won 2-0 with Bobby Charlton and Hurst on target. The performance had rekindled optimism about what the team could achieve at the 1970 World Cup. Stiles, who came into the side in place of Mullery against the USSR, wrote in his autobiography of the encounter: “It was, given the fact neither team could win the championship, a tremendously hard game and I had several collisions with a big, tough Russian.” It had been a tournament defined by physicality rather than flair. Italy went on to beat Yugoslavia after a replay, while England returned home not looking quite as unbeatable as they might have seemed beforehand. Being third in Europe seemed a very modest achievement compared to winning the World Cup. But only once since then have England again reached the Euro semi-finals, meaning their run in 1968 should not be underestimated.